John Moran Auctioneers is pleased to host a curated selection of nearly 100 handbags and accessories from such covetable brands as Chanel, Hermès, and Louis Vuitton. The small but elegant sale will kick off the second day of Moran’s December auction events, to be followed by Art of the American West in the afternoon. French luxury goods maker Hermès has been crafting timeless and iconic accessories since their start as a harness and bridle maker to Europe’s noblemen in 1837. A vibrant blue 40cm Kelly bag, named in honor of noblewoman Princess Grace of Monaco, is made of plush Clemence leather is expected to sell between $5000 and $7000 at the block. The expected top lot of the auction is a rare and stunning 35cm Birkin bag made of porosus crocodile. The shiny black bag is a statement-making showstopper and is expected to bring $20,000-30,000. An elegant 18cm Constance bag in sturdy box leather is the perfect accompaniment for a jaunt around town. The black shoulder bag is estimated to sell between $3000 and $5000. Iconic brand Chanel is amply represented in the auction. 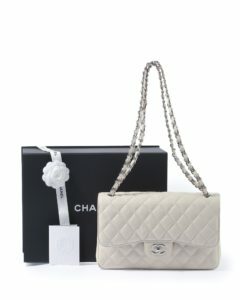 Among the many Classic Flap selections in the sale, a practically new Chanel Jumbo Classic Flap in luxurious cream caviar leather was made just this year and comes with its original box and paperwork (estimate: $2000-3000). 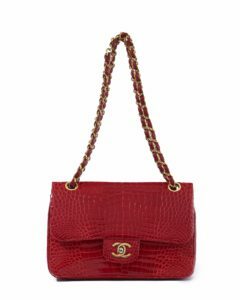 If subetly is not suitable, a head-turning Small Classic Flap in lavish red crocodile leather may be just the ticket. An enduring design rendered in a striking hue, the bag is estimated to bring $4000-6000 at the block. Louis Vuitton has created some of the most opulent and practical accessories money can buy. 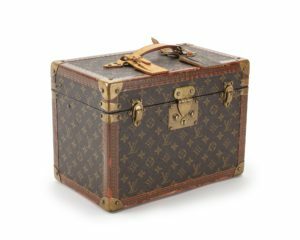 A classic toiletry/train travel case designed with the company’s iconic monogram canvas is expected to sell between $1500 and $2000 at auction. For a more updated version, Moran’s is offering a “Nice” beauty case with a zippered opening and soft-shell sides estimated to bring $800 to $1000 at the block. If traveling is not in the immediate future, a perfect everyday bag can be found in the beige papyrus leather Empreinte Artsy MM hobo bag with embossed decoration; it’s as practical as it is elegant with a roomy interior and versatile styling (estimate: $700-900). Hermès, Chanel, and Louis Vuitton are not the only design houses represented in the sale, a strong collection of other important designers are hitting the block in December. 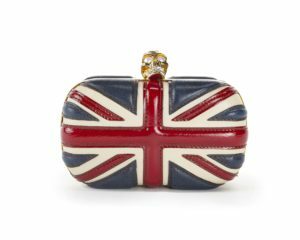 A “Brittania” clutch from the imitable Alexander McQueen features a Union Jack body topped with a bejeweled skull clasp sure to add a touch of punk style to any outfit (estimate: $600-800). A mini Lady Dior with acrylic handles and satin body is one of the brand’s most covetable pieces, expected to sell between $200 and $400 at the block. For those who need to run some quick errands, a wallet-on-chain from famed French house Yves Saint Laurent in flashy metallic silver will come to the block with a conservative $200-400 estimate. Consignment inquiries are always welcome, email info@johnmoran.com.